On Tone 8 a new Transformation begins with the help of Divine Agency. 8 is the number of Pure Spirit. Our energy shifts from an upward climb to a downward descent where Unseen Forces will draw us forward to a new Change within our Self. Reed/BEN guided our last trecena that raised us to see our place in a Divine Family. We were inspired to see our Home that lies within as the place of Sanctuary we can always turn to. This is the place we can draw down the Light of the Creator. We are given the Authority over darkness when we kneel before the altar in Humility. 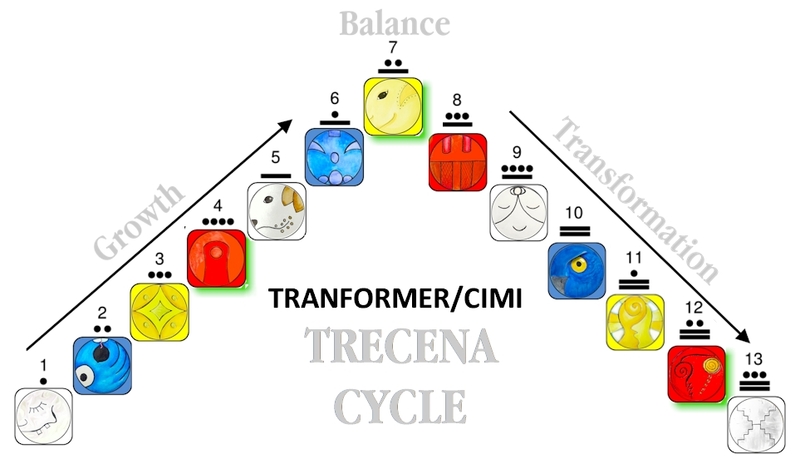 The Transformation of the trecena of CIMI, will be manifested from an effort and Intention that builds on the success of our last Ascension. Reed/BEN returns on the Holy Day of the CIMI trecena as the Higher Ground from which our Transformation will begin. Each Tone and each Trecena lead us through a rotation of “Light” and “Dark.” Our Transformation of Consciousness is accomplished by Inspiration (Light) and Application (Dark). Red and Blue Day Signs bring the New Light of Inspiration. We are inspired once again by Reed/BEN to see how the Sanctuary we built within will be the Guiding Light for CIMI’s Transformation of a Major Life Change. Reed/BEN draws our thoughts to the Blessing of Home, Family, and the Joy of Children. All the comforts, blessings, and Feelings of Home exist in our Inner Sanctuary. This altar exists everywhere that We Are for the purpose of Connecting us to the Creator. The glyph illustrates an altar by its horizontal line. Above are the channels of Light and below are the prayer mats where we kneel in humility before the throne of God. Today we are called to this altar again, the place where we would experience our Authority of Spirit. Reed is a symbol of the Hollow Bone, the channel through which we hold Communion with the Creator. The lights that reach only part way down illustrates that we have yet to experience the Creator’s full Light. Reed/BEN shows us the place where we will Experience our Divine Destiny. Reed is said to be the day to Bless or Repair our Home. On Earth, this is a Day to help others, to set things right, and to restore our closest relationships by Paying Back and Paying Forward. Our Right Relationship with others Purifies and Transforms our altar in Spirit. The differences in our relationships that cause us to withhold our Love, evidence that our channel is not fully opened. We are drawn to see where our Love is still given with a Condition. Without Unconditional Love, we have no Spiritual Authority because we don’t reflect the Spirit of our Divine Creator. Reed can help us see that we need to repair the Connection to God that is present in every Human. We are called to see that we are All Channels of Divine Light. When we can see this Light in One Another as the Hands of God… when we Hold One Another’s Hands we will Know the Full Light of the Creator. Tone 8 holds the Intention of the Justice of Harmony and Equity. A Divine Agency will make it So, as we turn to this altar within. We are beginning the Transformation that will help us see that this is the place we can always go to resolve the Fear of Illusion. When we get caught up or afraid of our Human experience, there is a Place of Communion that will offer us the Divine Discernment that all is Right, Good, and in Divine Order. As Above, So Below. When we appear at the altar Below, we are present at the Creator’s altar Above. To receive the Crown of Authority, we must Shine our Light of Unconditional Love in All Directions. In Humility and Gratitude for every experience, we can see that every person in our life was made to help us see the Light, to Become a Personification of the Creator’s Light. To all my relations, on the day of Divine Justice and Divine Agency, may we kneel in Humility and Gratitude, that we offered a Blessing of Divine Intervention. May we remember that our Highest Consciousness is only made possible by Forgiveness. We can share our Light Equally through the Spiritual Gift of Harmonic Resonance. From the altar within we can Emanate our Love to all of Humanity. May we Receive the Gift of Loving Unconditionally that fulfills our Divine Destiny through a First Hand Experience as the Giver of Unconditional Love. May our Hands reach out to One Another with the Love capable to restore every relationship. May we be the Light that would lead to a Divine Altar. As we kneel in Humility, may give thanks for a Divine Agency that Perfects us through a new Transformation to take on the Authority of the Creator through the Unconditional Love that dispels every Darkness.